NBA fans have heard some strong denunciations of President-elect Donald Trump from NBA coaches this week. Steve Kerr voiced concerns over his children’s reaction to Trump and Stan Van Gundy called Trump a “misogynist leader.” However, we hadn’t yet had anyone go biblical with his diatribe, until now. Well, he almost went biblical. “The disgusting tenor and tone and all the comments [during Trump’s campaign] that have been xenophobic, homophobic, racist, misogynistic, and I live in a country where half the people ignored all that to elect someone. Not sure where Popovich got the idea that Trump has walked back all of his campaign promises. The two provisions of Obamacare that Trump mentioned wanting to keep happen to be the most popular provisions of the law, and neither has anything to do with denying you the right to choose your own coverage or hiking premiums to some ridiculous degree. In fact, Republicans, at least twice, have offered alternatives to Obamacare that included those provisions. So, Trump has not come off his dime in any way. 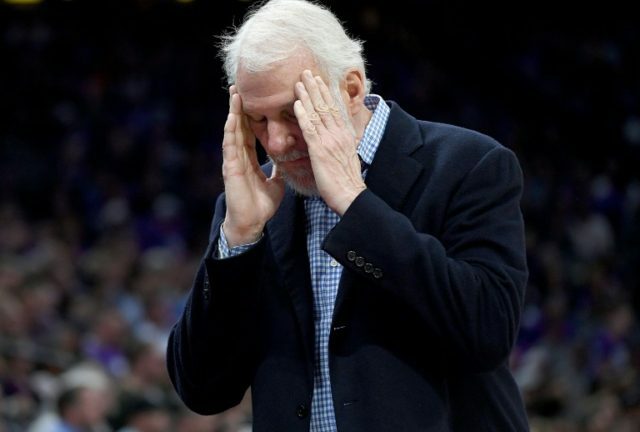 Popovich, however, has completely come undone. What’s different about Popovich’s rant, as opposed to Kerr’s and Van Gundy’s, is that instead of mostly confining his criticisms to Trump, “Pop” makes a point of going after Trump’s supporters. Probably not a great move, considering Popovich lives and works in a state that Trump won by nearly ten percent.